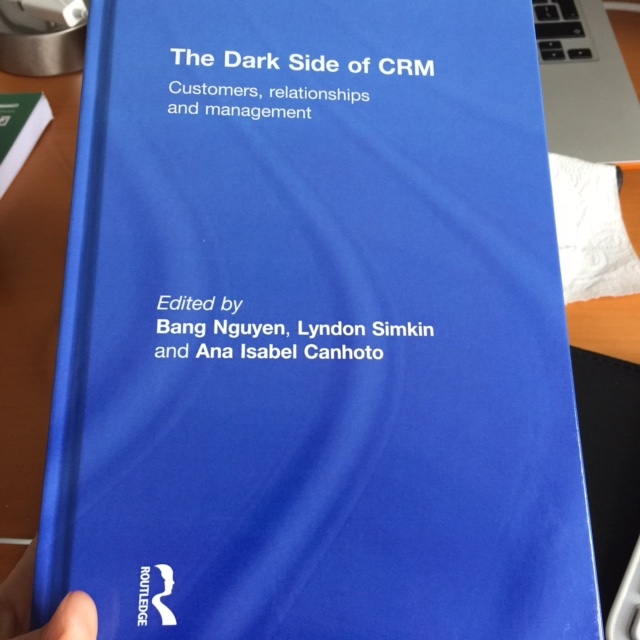 I just received my copy of the book ‘The Dark Side of CRM – Customers, relationships and management‘, which I co-edited with Bang Nguyen and Lyndon Simkin and can be ordered here. The book tackles the duplicitous practices and undesirable behaviours that affect the relationships between firms and customers. Building relationships with customers enables a firm to learn what they want, through continuous interaction and increasing customer intimacy, and to find ways to add value while increasing competencies and skills. However, some practices, such as binding contracts, hidden fees or confounding clauses, exploit customers and damage the relationship. In addition, some practices, such as price discrimination, may be deemed unfair and lead to dissatisfaction. Likewise, rushed and careless use of social media to engage with customers may damage rather than enhance the relationship between the firm and its customers. It’s not just firms that veer to the dark side, however. Customers, too, can undermine the relationship and, so, the book explores themes such as consumer rage, revenge behaviour, or opportunism. The book even contains a chapter that looks at the use of customer relationship management principles by criminal organisations. Not only is the topic highly original, but the book also brings together contributions from many of the leading exponents (practitioners, as well as academics) of Customer Relationship Management, and, so, is packed with rich insight and interesting reflections. PART I: INTRODUCTION This part sets the scene and provides a commentary to the separate contributions in The Dark Side of CRM. This part revolves around research studies focusing on customers’ responses towards the dark side of CRM. It explores consumption behaviour and the psychological underpinnings in the customer decision-making process. This part examines different relationship marketing and management studies from extant economic, consumer behavioural and psychological theories and research. It presents important aspects of social indicators influencing relationships in varying contexts. This part covers the management perspective of CRM’s dark side and includes companies from a wide range of industries. The focus is on identifying and overcoming the dark side at the management level. This part rounds off The Dark Side of CRM, suggesting some emerging themes and priorities. If you would like to know more about the book, get in touch with me. I am also happy to do a talk for your class or team, if you teach or work in this area. Posted on September 8, 2015 September 5, 2015 by anacanhotoPosted in Academic writingTagged AcWri, Bang Nguyen, CRM, customer relationship management, Dark Side of CRM, Lyndon Simkin, New book.